Gripple T-Clips provide a quick and easy way to tie-off netting at the start or end of a fence line. Gripple T-Clips can be used in conjunction with all types of stock fence; they can also be particularly useful for horse fencing, where narrow distances between vertical wires results in less space to work with. 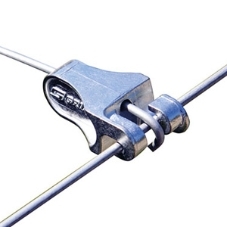 Gripple T-Clips are also suitable for tying-off barbed wire on fencing posts. Working with T-Clips is faster than knotting wire when tying-off; they work by simply twisting the T-clip on the line wire and then pushing the tail wire through.